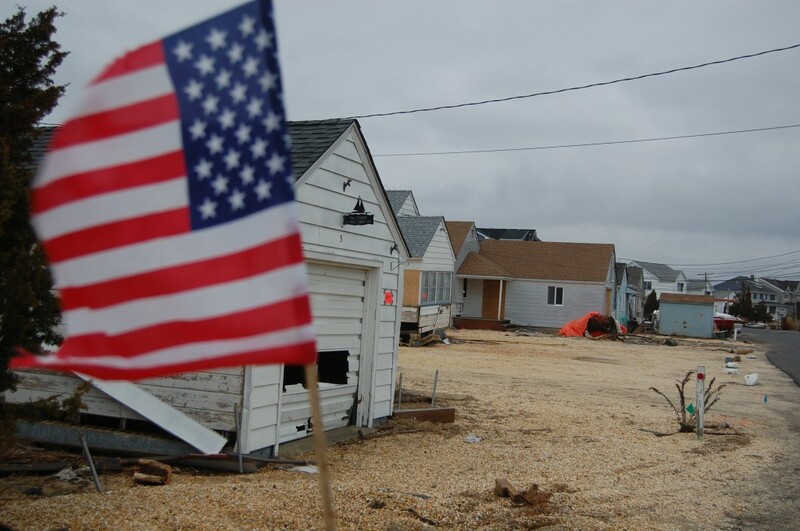 Since Superstorm Sandy struck in 2012, much has been made of the importance of dunes to protect the township’s oceanfront from breaching in a future storm, but comparatively little has been said about protecting homeowners on streets that are prone to flooding from Barnegat Bay and other waterways, such as Kettle Creek and Beaver Dam Creek. ans were presented at a meeting held Wednesday night, while officials are planning a similar meeting on the barrier island in May. Plans to reduce flooding are numerous and variable, comprising solutions that range from developing marshlands in such a way that they better absorb flood water before it reaches streets to physically raising the level of roadways in and out of developments that would be used as evacuation routes during storms. Development has increased ever since, but not necessarily in a uniform fashion, providing both pitfalls and opportunities to improve flood preparations. “You have a combination of homes that are rebuilt, homes that are waiting to be rebuilt, lots that have cleared and lots that have never been built on,” Roberts said. For the purpose of the study, neighborhoods were combined into four catch-all names. The barrier island was represented on its own report, while the Shore Acres report details that neighborhood as well as streets off St. Lawrence Boulevard and the Baywood section. Cherry Quay, Bay Harbor and surrounding streets were combined into another report, while the final report looked at flooding along the Metedeconk River and Beaver Dam Creek in the Princeton Avenue and Midstreams sections. Each of the reports are about 100 pages in length, and are “holistic” in nature, looking at overall quality-of-life items such as bike lanes and signage in addition to flood hazards. The flooding issues, of course, are the primary focus of each report. The reports provide an immense array of background information and end with conclusions and suggestions on how to prevent future flooding based on scientific studies, engineering work and public input. In Shore Acres, the report suggests raising the level of streets that are most prone to flooding and also used as evacuation routes. The suggested streets to be raised include Rochester Drive and Toronto Drive; Knollcrest Avenue, Nokomis Drive, Holly Avenue, Pilot Drive and Mandalay Road; Drum Point Road (within Shore Acres), Vanard Drive, Shore Drive, Waterway Court, Adair Drive; St. Lawrence Boulevard to Cadiz Drive, Cadiz Drive, Valencia Drive, Alhama Drive, Cartagena Drive, Toledo Drive, Seville Drive, East Granada Drive, West Granada Drive and Alameda Drive to Pilot Drive. The report also suggests upgrading storm drains to allow a more efficient flow of water, which would prevent “reverse flooding,” water entering storm drains during storms. Additionally, the consultants agreed that the township should consider reconnecting the street grid between Shore Acres and Baywood, allowing for better accessibility during storm events and evacuations. The report also said that, due to lot sizes which vary greatly in Shore Acres and surrounding neighborhoods, the township should consider amending its zoning ordinances to reduce side-yard and front-yard setback requirements to make it easier for homeowners to elevate their homes and provide proper access. The are around Angela Hibbard Park, the report stated, should have its zoning changed from R7.5 (requiring 7,500 square foot lots) to R5 (requiring 5,000 square foot lots) to better reflect the neighborhood’s layout and limit the number of homeowners who would need to obtain variances to raise or upgrade their properties. Given the number of vacant lots in Shore Acres, the township should consider acquiring some of them to be used for water retention purposes that could double as public open space areas, the report said. On some streets, bulkheads should be replaced by “living shorelines,” gentle slopes with vegetation, sediment, sand and small rocks, that can act as breakwaters and absorb some of the impacts of flooding. The living shorelines should be utilized where bulkheads exist that are not “directly protecting improved properties.” In these areas, the report found, the bulkheads exacerbate erosion and push floodwaters through storm drains, where a living shoreline would not only provide additional open space, but provide an area where the water could naturally flood without impacting roads or properties. The suggestions contained in the Cherry Quay-Bay Harbor report largely mirror those of the Shore Acres report, with a number of specific suggestions. Street levels on certain roads should be raised, including: Bay Harbor Boulevard, Bay Way, Queen Ann Road between Hemlock Drive and Bay Way, Blue Cedar Drive, Brookfield Drive, Sunnydale Drive, Fountainebleau Drive, Homewood Drive, Acapulco Drive and Van Cortland Drive; Captain’s Drive, Royal Drive, Clubhouse Road, Topsail Road, Port Road, Bark Road, Seagoin Road, Boom Lane, Cross Trees Road, Mizzen Road, Tiller Lane between Royal Drive and Clubhouse Road; Tunes Brook Road, Kettle Creek Drive between Tunes Brook Road and Heron Road; Pleasant Drive, West Pier, South Pier, Claudia Road; Seaview Avenue between Nautilus Drive and the cul-de-sac, Jetty Court and Compass Avenue. For better access, the township should consider connecting the two sections of Seaview Village if the opportunity arises, the report states. Additionally, the report said that in Cherry Quay, Bay Harbor and the surrounding neighborhoods, special attention should be paid to utilizing all open space and conservation lands in a dual role to manage stormwater and provide public amenities. “The neighborhood was built on former wetlands between four different tributaries at the head of Kettle Creek,” the report said, suggesting that the township – in approving new development or repurposing open space, should avoid asphalt and concrete wherever possible in favor of pavers, gravel or grass. One are that needs to be “drastically improved,” the report states, is the catch basin pond in Cherry Quay. The pond, located on a square lot bordered by Port Road, Bark Road, Clubhouse Road and Boom Lane, is half-owned by the township. “The plan, specifically, talks about the idea of making that a major project,” said Roberts, the consultant. The township “should explore the engineering of placing outfall pipes from the catch basin to the lagoons with a bevel for one-direction flow,” the report suggests. To reinforce the system and ensure that surrounding properties are not flooded by the catch basin, the area around the south-southeast of the basin should be raised, according to the report. Roberts said improvements to the pond should include cleaning debris out, opening up pipes that are filled in and creating a stormwater management facility on the property. The plan for the Princeton Avenue and Midstreams sections of town, impacted by the Metedeconk River and, to possibly a larger extent, Beaver Dam Creek, calls mainly for enhancing and restoring wetlands so floodwater has places to go. The barrier islands that form lagoons in the creek “present a good opportunity” for enhancing wetlands because they offer a stable new environment for marshes to grow, according to the report. Wetlands should be extended farther into the creek and river, providing a larger area for floodwater to naturally collect. Also: “Near Windward, design an area that will invite floodwaters so flooding can be reduced downstream,” he said. As with the other neighborhoods, the report recommends several street be raised, including: Princeton Avenue between the end lagoon and Point Avenue, South Drive, North Drive, Bay Avenue, Point Avenue, 4th Street, Parker Avenue between 4th Street and 2nd Street, Lenape Trail, Island Drive and Island Court; Leone Drive between Sanctuary Court and Midcen Road, Arnies Pointe, Cliff Road, Albert Road between Cliff Road and Manorside Drive, Manorside Drive, Rahway Drive, Midwood Drive, Harbor Road, Clematis Place, Robin Hood Road between Elgin Parkway and Albert Street, Habor Place, Field Place, Carroll Fox Road, Bancroft Road, Ernestine Place, Bella Vista Road between Jordan Road and Rainbow Drive. For the plan to come fruition, funding will be required, officials said. For high-priority and low-budget items, the township could look into funding the improvements through its annual capital budget, said Tara Paxton, the township’s assistant planner. Several of the other measures suggested in the report could qualify for grant funding, a major driver behind the report’s creation. Paxton said the township had previous applied for a grant to improve the Cherry Quay retention pond but did not qualify for the money. Armed with the new report, the township will try again, she said. The existence of the reports and plans also contribute to the township’s application to be included in FEMA’s Community Rating System, which scores municipalities that have put together solid plans to prevent flooding. The more points the township accrues, the more FEMA will discount flood insurance plans for residents of the township. Brick, which has never participated in the CRS program, is currently applying to be included. “What we really focused on is what we can do better in the future, and how we can recover from that kind of storm event,” Paxton said.